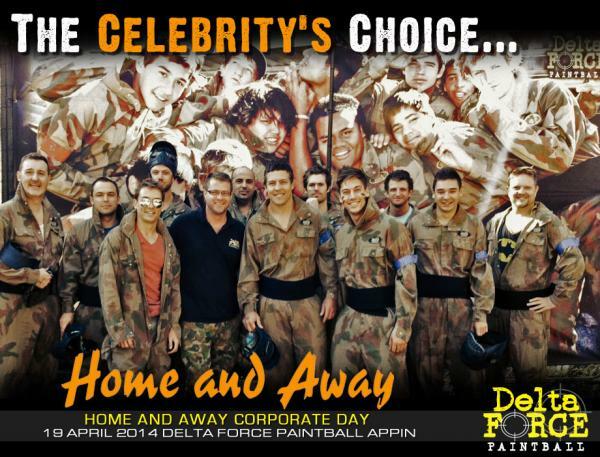 The infamous ‘River Boys’ aka the Braxton brothers of one of TV’s most popular ever soaps, Home & Away, arrived at Delta Force Paintball’s Sydney location at Appin on Saturday ready for trouble. Along with other characters from the long running show, two of the Braxton’s, namely heart-throb actors Lincoln Younes and Steve Peacocke were at Sydney’s best paintballing location bright and early. Also present was Summer Bay’s ‘hot’ new doctor, Dr Nate Cooper, played by the popular Kyle Pryor and, equally rated on the eye candy charts, Jake Speer who fronts as Oscar McGuire on the show. Accompanied by several members of the show’s production team, the Home and Away crew spent a full day enjoying paintball at it’s finest. Taking advantage of arguably paintball in Australia’s best deal, the players suited up with full Terminator Packs which gave them total protection and a whopping 1000 balls to spray around to their hearts content. It was very encouraging for the Delta Force Paintball staff at Appin to hear the TV stars and their production experts remarking so favourably about the quality of not just the game play and professionalism, but also the high level of game zone sets and props. The incredible full scale Black Hawk helicopter on the Tropic Thunder field did, of course, impress, however, it was the Resident Evil zone and it’s game play the Home and Away crew chose as their favourite for the day, further exhibiting how a day at Delta Force Paintball holds the variety needed to make everyone’s day, a day to remember.